Why is it important to have a proper aircon installation? Proper installation of the air conditioner is extremely important because improperly installed air con can be a nightmare for you sooner or later. Sometimes, you may not see the effect happening immediately but weeks or months later, the problems will surface. Some home owners invested significantly in decorating their home. However, as their air conditioners were not properly installed, certain parts became defective very fast. The owner had to tear down their home decoration because they need to replace these defective parts. If you read the list of aircon problems and their causes under our “Aircon Repair” page, you will find that improper installation or used of low quality material for installation can attribute to a number of aircon problems such as condensation or water leaking etc and you will need to re-do the installation to correct these problems. What contribute to a good and proper installation? A good and proper installation depends on two key factors which is the quality of the installer and quality of the material used in the installation. The quality of the air con installers depends very much on the practical working experience of the installers and their commitment in the company. Some company has in house installer whereas some company outsource their installation to third party sub-contractors. Needless to say, the level of commitment from an in house employee would be much higher compared to that from a third party sub-contractor and the quality of service would vary accordingly based on the level of commitment. Why is quality of service so important? For example, if the installer did not ensure that the gradient of your pipes are properly fixed, you will face water leaking problem sooner or later. Quality of the material used in the installation is also very important in ensuring that the system can function without problem. Take for example, if you use poor quality insulator or insulators that are not thick enough for your air con system, sooner or later, you will have condensation in your aircon trunking and your will need to change the insulators to correct the problem. This can affect your home decoration. What can you expect from CitiCool’s aircon installation? In CitiCool, we have a team of very competent in house installers to help you install your air conditioning systems. The team has an average of more than 15 years of experience in installing different brands of air conditioners. We only deploy the most experience technicians with many years of installing experience for installing work. Our installers work as a team with at least 2 person and all the members in the team have strong installing experience. In addition, we also use only high quality materials in our aircon installation. High quality material are necessary if you want to make sure your air con function effectively without any problems such as condensation or water leaking etc. Therefore, our customers can be rest assured of proper installation with quality workmanship and quality material for your air conditioning systems to function effectively. the resultant annular space between the casing and service pipe is machine filled with polyurethane foam in a homogeneous condition. it helps to reduce energy cost. 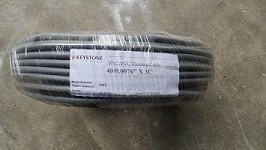 The Keystone Cable is a PVC flexible Cable. 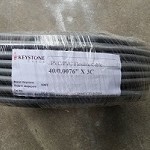 It is manufactured in Singapore by Keystone Cable, a company accredited with ISO 9001, ISO 14001 and OHSAS 18001 for the quality of their cable. This cable is a high quality cable. If you are staying in a HDB flat, as a flat owner, there are certain guidelines and regulations on aircon installation that you to be aware of. You need to install your air conditioning system at an approved location as well as using the approved installation method. Do note that all air conditioners must and can only be installed by a BCA trained installer. For more information on the installation guide from HDB, please refer to the guide.provided on HDB website. What is the air con loading allowed for my HDB block? Depending on the electrical loading of your HDB block, you may need to apply for “Electrical/Air Conditioner Installation Permit” before installing your air con. You can key in your postal code and check whether you need to apply for a permit here. What is the total maximum current and condensing unit weight allowed for my HDB flat? HDB website provides a table of total maximum running current allowed and air conditioner condensing unit maximum weight allowed by different flat type, i.e 1/2 room, 3/4/5-room/executive masionette etc. To have a good understanding of various guidelines governing aircon installation works for HDB flats, please refer to the guide provided by HDB website below click here. Citicool can help you to relocate your entire air conditioning system. Please contact us for the quotation. Citicool can help you to remove your entire air conditioning system and even purchase the old system from you if you intend to dispose them. Please contact us for the quotation.